We all juggle multiple tasks throughout our daily lives, rushing to get one thing done before tackling another. Wouldn’t it be nice to sit down, relax and have a cup of coffee? 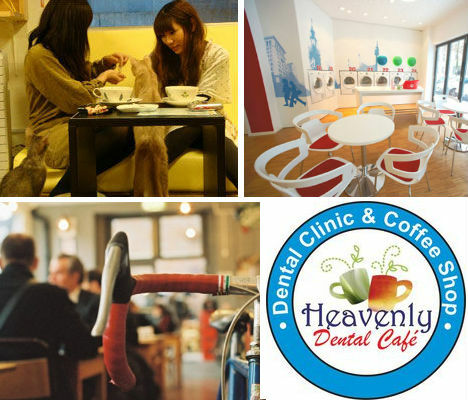 At these 12 multi-functional ‘combo’ cafes, you can do your laundry, get a fishy pedicure, have your bike repaired or play with a rented cat and enjoy a drink at the same time, without ever having to leave the room. Have you ever sat for hours at a laundromat, wishing it had the ambiance of a coffee shop? Too bad you don’t live in Munich (or do you?) so you can hang out at the Wash & Coffee. 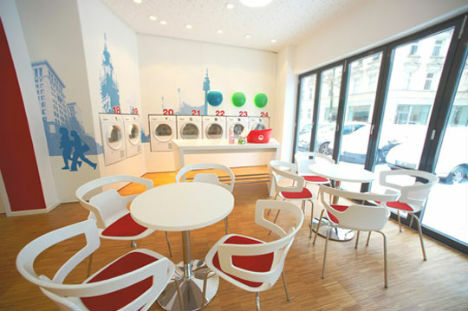 With its bright modern décor, cafe seating, hot beverages and even sandwiches and salads, Wash & Coffee makes the chore of laundry much more fun. Sit back and relax with a book, a coffee… and an extremely ticklish pedicure courtesy of a tank full of ‘doctor fish’. The Dr. 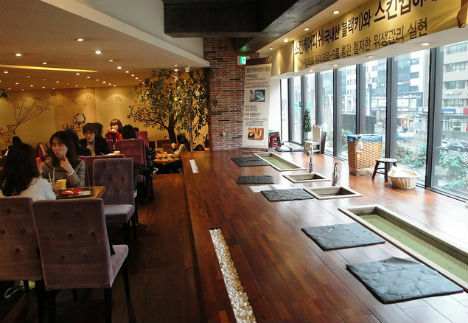 Fish Cafe in Busan, South Korea lets you do just that. You order a drink, and when you’re done, head over to the spa area where you wash your feet and then let the fish snack on your dead foot skin. Yum. The whole experience costs less than $10 USD. Grab a cup of joe and munch on a muffin while you’re printing documents or photos – just be careful not to spill or smear. 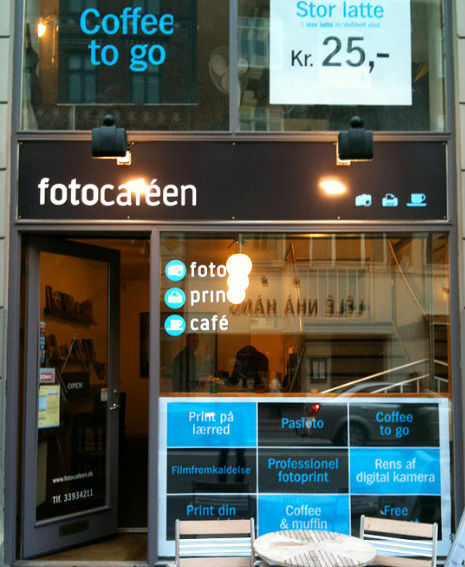 The Fotocafeen bar in Copenhagen entices people who need printing services to stay a bit longer, enjoying a beverage while they wait. 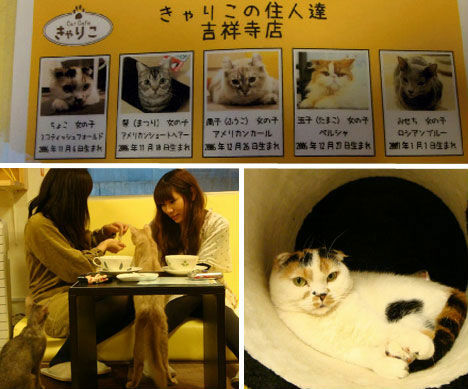 Before you even see the coffee and tea menu at the Calico Cat Cafe in Tokyo, you’re presented with a menu of a different sort: a selection of cats from which to choose. Not to eat, you understand, but to pet and coo over. Guests are given complimentary bags of cat food and allowed to play with the cat of their choice. It may seem strange, but in this city – where owning a cat is often impractical – “commitment-free cat stroking” is an attractive option. The Urban Station in Buenos Aires is just one of many coffee shop/coworking space combos around the world, where mobile workers can get a coffee and camp at a table, using the free wi-fi as long as they like. 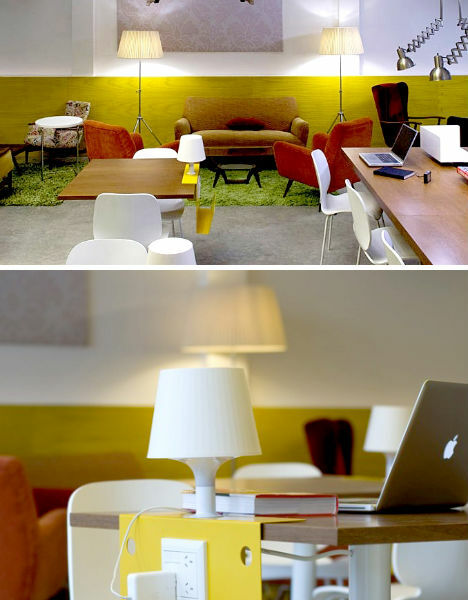 The Urban Station has plenty of accessible outlets and also offers conference tables and other coworking amenities. Combination car wash/coffee shops are more common than you might think, present pretty much all over America. 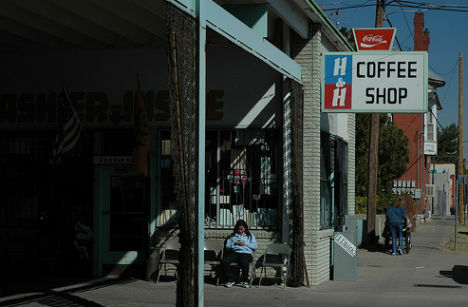 The H&H in El Paso is an iconic example, open for decades, proving that providing coffee along with other urban services isn’t just a passing trend. You’ve heard of biker bars for motorcyclists, but what about cafes for bikes of the pedal-powered sort? 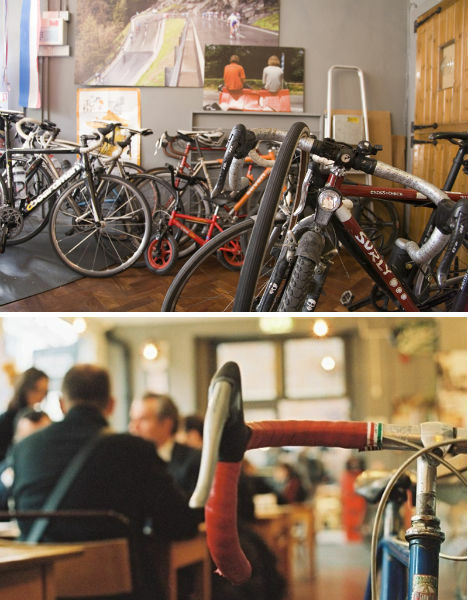 Bike cafes are popping up everywhere, and it’s easy to see why cyclists love them. At London’s ‘Look Mum No Hands’, there are plenty of places to park your two-wheeler or even have it serviced while you use the internet and nosh – a great addition to an increasingly bike-friendly city. 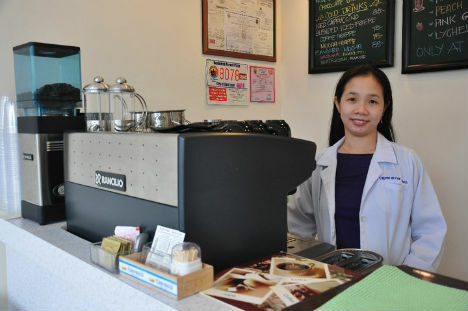 Combination florist/coffee shops are also surprisingly common. 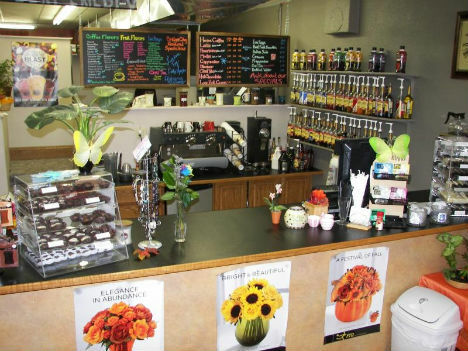 The Bridge City Florist in South Dakota is one of many that create a tie-in by selling not just coffee and tea, but also chocolates – a logical companion to a fresh bouquet of flowers. 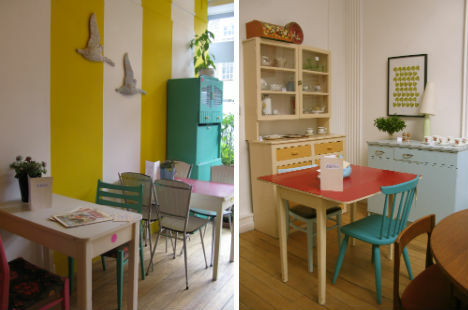 Are you enchanted by the cute, creative décor found in many coffee shops? Then you should check out London’s Drink, Shop & Do, where virtually every item you see is on the menu. Including the furniture, vintage tea sets, wall hangings and knick knacks. This set-up gives you a chance to sit and contemplate the items on display. The ‘Do’ part starts at 7:30pm, when the shop hosts crafting events like card-making and paper mache. 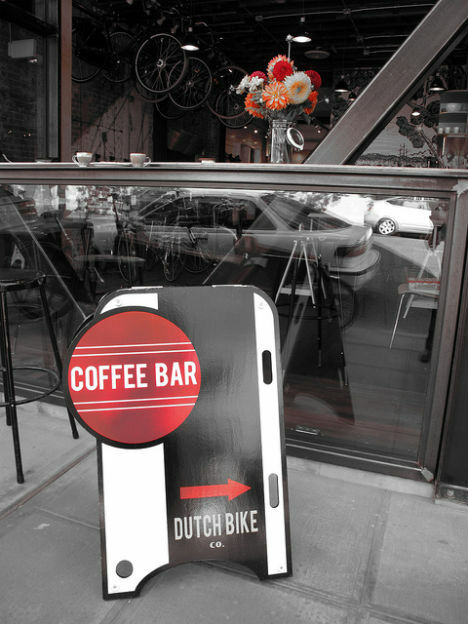 Dutch Bike Co. in Seattle is another bicycle-themed coffee shop where cyclists can buy a bicycle or accessories, have their own repaired or simply park and drink. The shop also rents 3-speed classic city bikes as well as ‘conference bikes’, where seven riders can sit in a circle and chat (with one steering). It’s the trifecta – some might say the holy trinity of cafe combinations. St. Luke’s Church in the tiny village of Kinoulton, England gets potential church-goers in the door by necessity since nearly everyone has to send a letter now and then, and gets them to stay with coffee and scones. 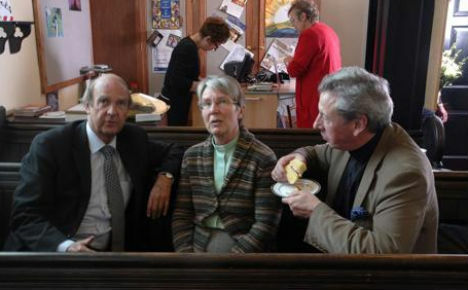 Leather sofas and contemporary dining furniture give parishioners a cozy place to chat.